We’ve all experienced it – you are driving your car, and just want to open the window to get some fresh air because it’s gotten a bit stuffy, but it is raining outside and opening the window will do more harm than good. The solution? Car window shields. They may be small, subtle and inexpensive, but car window shields (also known as ‘deflectors’) can make a great difference in your riding experience. Car window shields are designed to protect you and the interior of your vehicle from wet weather, by deflecting rain, sleet, wind and hail away from the windows of your car, truck or SUV. But their benefits don’t stop there. Car window shields also reduce your fuel costs and improve gas mileage because you don’t have to turn on your air conditioner to maintain a comfortable temperature inside – instead, you can crack your window and get some fresh air inside. Car window shields come in a variety of finishes to suit different tastes. There is a variety of deflectors and visors with a translucent finish that have a subtle look while filtering out sunlight. You can also opt for a set of chrome window shields to add a gleaming touch to your vehicle’s exterior. Take the following steps to find the right car window shields for your vehicle. Buying the right window shields for your vehicle will depend on where you live and drive mostly. For example, if you live in a sunny and warm climate, keep your interior intact with AVS window visors and a wade sunroof deflector. If you drive a pickup, a wade rear window deflector will help block some sunlight, lowering your car’s temperature. If you live in an area where there are a lot of bugs, one way to keep your vehicle looking great and keep your windshield clean is by installing a bug deflector. Lund bug deflectors and stampede bug deflectors offer great protection against big and small bugs. 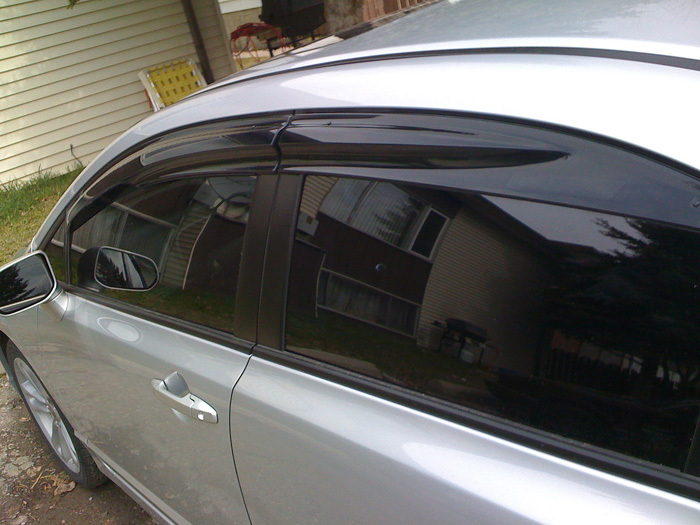 Window shields are great for protecting your vehicle’s exterior against damage. Hood deflectors are good for keeping debris and rocks at bay, protecting the finish of your car from nicks and scratches. A set of visors will provide you a wind-free and quiet ride. Keep in mind that a set of deflectors can greatly impact the look of your vehicle. Whether you are after the subtle look of a smoke bug deflector or the head gleam of chrome window deflectors, with the wide variety of choices on the market today you shouldn’t have a hard time finding what you want and need.